A Vampire’s Thirst…Dark Dangerous and Deadly. 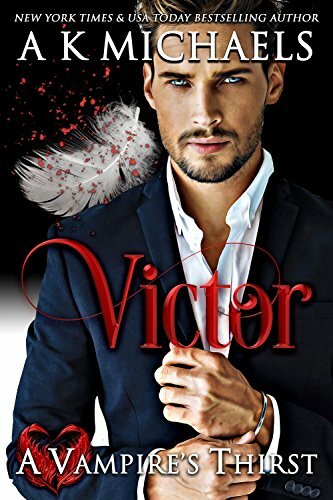 Victor Strong, ancient Vampire and hard-as-nails businessman, is strong in name and nature with a steely control over everything…until it comes: A ‘Thirst’ he has no control over and cravings for blood and other, darker and more enticing desires, rapidly growing out of control. If a solution isn’t found, The Directive will come knocking on his door. As if to answer his prayers for a cure to his madness, a sweet, tantalizing scent casts a spell over him. Hypnotized by that which were thought to be mere myths, the most precious of all things—a Vampire’s Bloodmate—he leaps from his balcony and goes in search of the scent’s owner. If he fails to find her in time, he’ll be lost to the dark side forever. But if he succeeds, her very life could be at risk. Fans of CHRISTINE FEEHAN and LYNSAY SANDS will thrill to A VAMPIRE’S THIRST, the latest paranormal romance in A K Michaels' hit series that readers are calling suspenseful, scorching hot, and not to be missed. Scroll up and one click to start reading today!